Progress has been made on Mystery Shawl #3. I’m 3/4 of the way through clue 2. Yawn. I’ve never been a lace knitter and this project seemed like a good little toe dip into this genre. The pattern is free and released in small segments so I won’t get freaked out. Plus I had some laceweight cormo sitting around doing nothing. People have told me that lace was easy and of course I could do it. Yeah, that’s true. The hardest part is developing a system of keeping track of your place in the chart. I’ve devised a system of post it notes and bookmarks. It’s percarious, but works fine. I think I’m not a lace knitter because I don’t like to HAVE to blindly follow a chart. I can’t memorize the pattern as it’s very complex. At this point I can anticipate what’s coming up but I’m lost without the chart. I like being more self-sufficient. I also miss the emerging shape of the garment. That’s the larger problem for me as a person interested in how clothes are constructed. There’s nothing there to hold my interest. I shall knit on just to say I tried it, but there will be no amazing lace knitting coming from me. I guess I’m a zigger and lace is a zagger. I think I love knitting lace(or cables and the like) to watch the pattern emerge, and knit clothing just to be worn. I won’t hold it against you. 🙂 There are shawls out there with rather clever construction, though–although often the clever bits involve novel ways of turning corners…. I really like simple lace, like Birch or Flower Basket. More complex stuff doesn’t thrill me either. Although I do marvel at what Alice does. 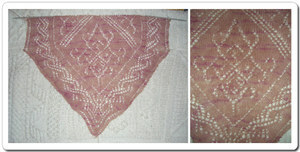 Try the Shetland Triangle, it’s even easier than the Flower Basket Shawl. We seem to be in lock step on the Mystery Stole. I love watching the pattern emerge.